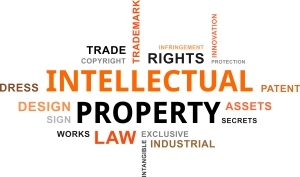 Home » What does a business owner need to know about intellectual property? Most business owners understand that the real value of their business isn’t in tangible assets. That is, the inventory, office or store space (typically a lease), furniture, shelves, even the delivery truck, is not what adds value to their business. Instead, it is the intangible assets that really add value to the business. Intangible assets such as, well-trained employees, effective managers, a head chef at a restaurant. But it’s the intangible assets such as, a secret sauce, a manner of doing business, a brand, that often add the most value to a business. These intangible assets often take a lot of time and investment to develop, and without these, the business may not be successful. These intangible assets are referred to, in the legal world, as intellectual property. So even if you didn’t think that you had any intellectual property, chances are now that you understand what intellectual property is, you recognize as a business owner that you do have intellectual proprety. Specifically, the “secret sauce” is considered a trade secret (as are customer lists, vendor lists, and so forth). The manner of doing business and the brand may be marketed under what is considered a trademark (as are the names, tag lines, and graphic logos). Restaurant menus, websites, and brochures may all be protected by copyright. Trade Secrets. A trade secret is anything that can be maintained as confidential (and typically by protecting it from competitors, also adds an edge to your business over competitors). There is no formal or government registration required. However, if a trade secret becomes known publicly, then it is no longer protected under the trade secret laws. Trademarks: A trademark is a name, tag line, graphic (or logo), or combination of these, that designates the source of goods or services in commerce. When used in interstate commerce, the trademark can be registered with the US Trademark Office. Otherwise, state registration may be available. Copyrights: A copyright protects original works of authorship. Copyright does not protect an idea in your head. The authorship must be reduced to a tangible medium, such as a recorded song, a written story, a picture painted on a canvas, or words typed on a website. Patents: A patent protects an invention. The invention must be novel and non-obvious in order to receive patent protection from the US Patent Office. There are no state registrations for patents. For more information, please read Mark Trenner’s article “Top four ways to add value to your business” published in CoBiz Magazine.